Many years ago, maybe as much as 50 years, I remember Christmas figures with candy in them. These plastic figures included a snowman, a Santa on skis, and a red horse with wheels. Rosbro plastic snowman from the 1950s. A fun collectible. They were fun to play with and pretty sturdy. Many are still around today. Often, the pipe breaks off the snowman and the reins of the horse are gone. I happened to find some at yard sales and flea markets, some twenty years or so ago. They brought back childhood memories of 1950s Christmas times. Now, I use them in my Christmas decorating. Rosbro Santa on green skis, snowman with a pipe, and red horse on green wheels. You can find them on eBay at prices of $10 to $40 depending on condition and demand. Having the box adds to the value. My Santa no longer has the lightbulb and cord. These seasonal figures were made by the Rosbro Plastic Inc. of Providence, Rhode Island. The company also made hard plastic figures for Easter, Halloween, and other holidays. Rosbro Santa with original box. Other Christmas figures Rosbro made were white reindeer, a Santa on a bicycle, and Santa with reindeer and a wagon. Follow the link if you’d like to read more about collecting Rosbro hard plastic Christmas figures. 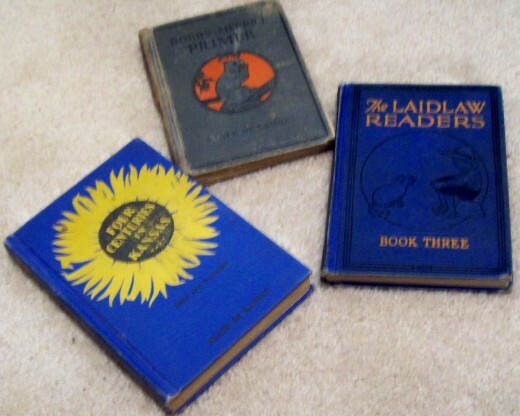 Do you remember any of these from long ago? Our guest blogger today is Monte Manka. He grew up in the 1930s like Gail Lee Martin did in Central Kansas. They met later in life through their writing when both were in their eighties. Monte writes poems and lots of nostalgia pieces. He just had his 91st birthday this week! In the good old days, I would get up in the morning in the early A.M. and set under the Holstein or Jersey and pull on those warm teats and get my milk. With my head buried in her flank, I could tell if she was going to kick me or not and I could get out of the way. (was not always successful though.) I loved to be hit in the head with a tail full of cockle burrs or in the winter time a tail with frozen urine on it. The feeling was the same, a bump on the head. When it was 100 degrees in the shade or 27 degrees below zero those critters had to be taken care of, come rain or shine. An old style cream separator. Then those calves would come along and you had to train them to drink out of the bucket–more problems–they seemed to get something wrong with them and you had to doctor them, more problems. When you finally got the milk into the house and separated, you had to wash the separator. This was another chore of mine. One part had 123 disks on it and they were numbered. The disks went in numerical order. The buckets had to be washed and by that time it was time to do it all over again. BAH TO THE GOOD OLD DAYS. While at the grocery store I also got a loaf of bread and it started me to thinking again. In the good old days, we took our wheat to the mill at Cedar Point and had it ground for flour, cracked wheat for breakfast food, and then took it home. Mother made bread from the new flour. The old wood stove felt good in the wintertime but was hot in the summertime. I spent time plowing, disking, harrowing and drilling the wheat. This was always in the hottest time of the summer when you would either thrash or combine. I always missed the Rodeo at the Countryman Ranch at Cassoday. After sitting on the tractor with the heat from the tractor motor blowing in my face, and the combine engine blowing hot air on my back, I was well done by the time the day was finished. Then to the milking again. We had a mean old sow. She bit my uncle on the leg and put a couple gashes in it. He did not quite make it over the fence. Now, this sow was the ugliest thing you ever saw and I could never see what the boar saw in her. She would have the most pigs and the healthiest pigs of any of the good-looking sows. These hogs would have to be watched closely to keep them free of screwworms. More work more worry. Once we had a bout with cholera and we lost 50 head that was ready to go to market. Needless to say, we had a big barbecue, too bad that we could not eat the meat. My uncle would give my brother and me a pig to sell if we would help him take care of them. One year we got $3.00 for our effort a few years later we got $6.00 then the market started to rise and no more free pigs. The good old days Phooey. There were some things that were good like the filling station on the corner. Nufer’s gas was 18 cents a gallon but you got your tires checked, windshield washed, oil checked, a smile and a thank you. The good old days, Yeah. Another good thing-a handshake was as good as a signed contract, Not now it seems like the honest people are getting fewer and farther between. Out here you had better have twenty signed contracts, even then someone will break them all, and you are stuck with a lawsuit. I always hear someone saying “Oh for the good old days.” I think back and no TV, no VCR, no microwave, no late model car. My gosh, I wouldn’t trade today for anything. Gail Lee Martin and Monte Manka first met on the Our Echo website. Gail served as the webmaster and encouraged everyone who posted there. She commented on every poem and each essay. Monte was the same generation as Gail, an octogenarian, who grew up just a few miles from where Gail lived in Kansas. Now he lives on the west coast, but through the serendipity of the Internet, they met online. Learn more about him below. 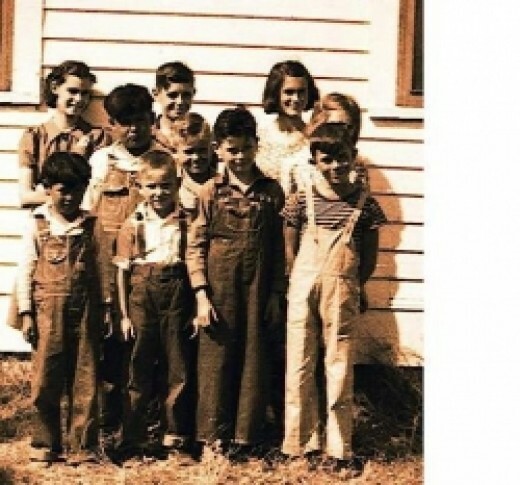 The kids at the Chelsea, Kansas school in the 1930s. Monte Manka grew up in Chelsea, Kansas in the 1930s. Now in his eighties, he records his memories in poems and essays for future generations to understand what it was like in those days. This webpage is just one in a series that features Monte Manka’s poetry of the Great Depression. This octogenarian retains vivid memories of Kansas farm life and his youth. He still writes poetry and posts it on the Our Echo website. Don’t miss the other webpages with Monte Manka’s poems. They include such old-fashioned topics as pie suppers and chivarees. Now just a tower of rust. Would make my life complete. And hear the locusts sing. Just when things were goin’ great. Doors and windows, not dust proof. He continues on telling about having to dust off the paper before writing the lesson. You’ll enjoy his memories. Our Echo provides a supportive community online for writers to share their family memories and other writing. It’s a great site to post your memory pieces on for your whole family to enjoy. Read more than 80 of Monte Manka’s poems and essays. Check back often as he posts more almost every week. 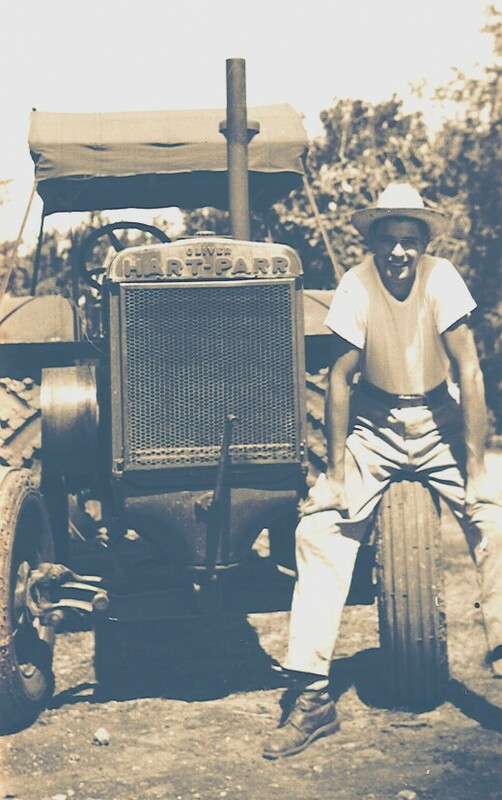 Monte Manka with an Oliver Hart-Parr tractor. Monte Manka: “Me and the Oliver Hart-Parr after it was converted to rubber–There is a tractor. In 2010, Gail Lee Martin won the Ferguson Kansas History Book Award for her book My Flint Hills Childhood. The award, presented annually at the Kansas Authors Club convention, was discontinued in 2017. Gail was one of the last winners of the award. The amount given to the winner, under the Ferguson Book Award, was $100.00. Gail’s daughters decided to revive the history book award using funds donated to KAC for the Gail Martin memorial fund. The new name for the award is the Gail Lee Martin Kansas History Book Award it will continue for at least 10 years. If more donations are contributed to the memorial fund, it can run longer. In previous years, the memorial fund paid for speakers for the convention. It would be good to streamline the process, so if you have any suggestions, please add them in the comments on this blog.